It has been a busy month for Star Citizen! In the past month, we’ve released Arena Commander .9 and then followed it up with a number of patches. Perfecting Star Citizen’s physics, flight model and multiplayer is an effort that studios around the world have come together for… but we’ve also been building deeper elements of the game! The September reports below will let you in on just what we’ve been spending our time developing. September was very busy and productive for the Santa Monica studio. Much of our focus this month has been on completing features and fixing bugs for v0.9 of Arena Commander. We were very excited about this release, as it introduced the new Murray Cup racing mode to the game, along with the M50 and 350R racing ships. Hopefully you all watched our “Galactic Gear” commercial that introduced these new features. There was quite a bit of buzz about the commercial around the Internet, and we were even referenced on the official “Top Gear” website for our homage to their show! How an idea becomes a ship. In addition to supporting Arena Commander’s development, we have also been improving our pipeline for creating new ships. Recently, the ship pipeline was moved from Austin to LA, and we have been hard at work refining our process and improving our workflow so that we can develop ships more quickly and more efficiently than we have ever done before. The creation of new ships for Star Citizen is an incredibly complex and detailed process, so it made sense to move it to LA where Chris can maintain oversight and provide direction to everyone involved. Part of our process improvements included sitting down and reevaluating every step of the pipeline and making necessary adjustments to the workflow. If you are curious about what that looks like, please see the attached diagram of what it takes to develop a new ship for the game. And beyond supporting Arena Commander and building new ships, we’re also preparing for Citizen Con and PAX Australia events coming up in October. A lot of work is happening around the company to put together a sneak peak of many of the new areas of the game that are currently in development. Stay tuned in the coming weeks as we reveal more of our progress to you. We have also been busy this month interviewing a number of applicants for various positions around the company. We’ve been talking to prospective 3D artists, concept artists, lighting artists, technical animators, technical designers, programmers, outsource managers, and many more. As a result, we’ve identified some really talented people who are ready to join us at Cloud Imperium Games. We’re very excited to be bringing on board some amazing new people who will help us to execute on Chris’s vision of the best damn space sim ever! As we add more resources to the project, it increases our development capacity and provides us with the ability to do even more on this ambitious project. None of this would be possible without all of our backers, so we thank you for your continued support in our development efforts! Now onto the departmental updates! Our engineering team in Santa Monica has been working on all aspects of Arena Commander this month. On the HUD front Brandon has been working on code support for new features and targeting modes that we are prototyping for introduction in a future patch to improve the HUD functionality and the user experience. Similarly everyone’s favorite Bug Smasher, Mark Abent, has been working with our Physics Programmer John Pritchett to improve everyone’s ability to “stay on target” with improvements to the lead prediction as well as some new aiming functionality for both gimbaled and fixed weapons that interface with the IFCS and should be rolling out to you guys soon. We’ve also created a new system for handling ship variants that cleverly allows us to share identical parts across variants. This new technology allows us to save an amazing amount of time and effort throughout the whole ship pipeline by eliminating the duplicate work we used to have to do updating the same pieces of a ship on all the variants separately. Now we can fix the bug or make the improvement we wanted to on the base model of a ship and it automatically propagates to all the variants of that ship that share that part. On the Graphics programming side our Engineer Okka Kyaw has been diligently working on moving to a 32-bit depth buffer. This will help to eliminate a lot of the z-fighting throughout the game. Previously the precision of the depth buffer was lacking which would cause geometry that was very close to each other to begin z-fighting when viewed from far distances. These fixes will be in an upcoming patch. Okka didn’t stop there though, he’s also begun the process of researching a developing a new vehicle paint system so that we can more easily create custom paint jobs for ships and paves the way for eventual customization by you in the community. Last but not least we here in Santa Monica had a Networking Summit where we hosted all of the top network and backend programmers from CIG and our partner studios led by Chris to discuss topics ranging from short term improvements like improving movement prediction, bandwidth consumption, server CPU usage, chat system, lobby systems, matchmaking, and telemetry data gathering. We also covered a multitude of longer term initiatives that included how best to handle clients migrating from server to server, handling the scale of the persistent universe, unified player and object ID’s for use across multiple servers, and a number of other topics dealing with delivering the most seamless multiplayer experience for both SQ42 and the Persistent Universe. All in all a very productive week long summit that laid a solid foundation for continued development. Design this month has been working in close collaboration with the Engineering and HUD team to design, prototype, and implement improvements to the HUD and targeting systems. Calix Reneau has been prototyping out ways to improve the control of gimbaled weapons on the control systems that commonly don’t natively support smooth analog movement such as joysticks, HOTAS, and gamepad peripherals. We are confident that these new systems, once implemented, will significantly improve the functionality of gimbaled weapons on these controller types. This month we have also been spending a significant amount of time reviewing community feedback on the balance of ships and their flight characteristics. You’ve already seen some patches since the V0.9 to address some of this feedback but we’re also working on some more long term balance changes that you will see in future releases. As part of this we’ve also been designing new weapons and items that we feel will further diversify the strategies that we see players using online. With the move of the Ship Pipeline to Santa Monica from Austin we’ve been building our Art team in Santa Monica with additional Concept and 3D resources. The team has hit the ground running and have been blazing away at all the new ships that we are concepting, adding the hangar, and adding into Arena Commander. We are also continuing to hire in order to increase our pipelines capacity for developing more ships simultaneously. Especially since as we move forward to the larger and larger ships they will occupy our Artists for longer periods of time than the single seat ships have. With regard to ship development, we have a number of new concepts we are working on this month, including the Hearald, Carrack, Reclaimer, Avenger variants, 890 Jump, as well as new concepts for various items and weapons. We’ve completed the models for the full Mustang lineup, the full Cutlass lineup, and beginning to dive-in on Avenger variants, the Herald, Redeemer, and a few others… Now that we have the new variant system from Engineering we’re also planning to tackle all the custom pieces, damage states, and LODs for the variants of the 300 series, Aurora series, and Hornet series to get all the variants dogfighting ready as quickly as possible from an Art perspective. The Art team has also been working closely with Production to flesh out the new and improved Ship Pipeline and helping to identify areas where we can improve quality, reduce time, and further parallelize the development of new ships. We’ve ended up with a new pipeline that we feel is much more streamlined and primed to deliver a higher level of quality much more efficiently. Of course pipelines are not set in stone and it will continue to evolve as we work with other disciplines to further improve and refine the process. The great thing is that everyone on this project is motivated by the same desire to achieve the best quality possible so modifying this pipeline has been a great collaborative effort with likeminded individuals. Our huge Cinematics team in Santa Monica who are responsible for the most recent commercials that we do for our ships have been hard at work, all two of them… John Griffith and Chris Wolak who were most recently responsible for bringing the M50 Galactic Gear commercial to life have been pouring that same creative energy into a new Cinematic in-fiction commercial that will be revealed at Citizen Con on October 10th. We are quite excited to share it with everyone and look forward to reading the comments and reactions. The great thing about the Cinematics that we do is that we use all our game assets and our game engine to create them. With the level of quality that the Art, Animation, and VFX teams are putting into these assets we are able to accomplish these beautiful commercials with a team of just two, very talented, individuals working diligently to use all these game assets to create a piece that matches Chris’ vision. We are also lucky to have two very talented writers, David Haddock and William Weissbaum who, when they aren’t working on Squadron 42, pen the scripts for these commercials. At any rate, we are truly looking forward to sharing our next in engine cinematic piece with all of you in the community in seven days and hope everyone enjoys it as much as we’ve enjoyed making it! Well that about wraps up this month’s update for everyone and while we aren’t able to cover every little detail we feel like this touches on the most important and interesting developments of the past month without crossing the 2000 word mark. As always we’d like to reiterate to everyone that we sincerely appreciate your support in making this game with us. Without you guys none of this would be possible and we are grateful for the opportunity to develop and share this game with all of you! The Austin team has been hard at work this month on many different fronts. We’ve been a bit more quiet than usual, but we are very excited to be able to have something to demonstrate very soon. Our team has been working hard on Persistent Universe tasks and a multitude of Live Operations activities. Here’s a brief report from each team! This month in Austin we have been hard at work on the Persistent Universe. We have made substantial progress on several of the core technologies critical to the Persistent Universe. Brian Mazza continues his work on server side persistence, which is essential to allow players to retain their inventory after they log out, among other things. James Wright and Allen Chen tag-teamed to wrap up Large World “Phase 1” this month as well, which is the first step to getting truly expansive galaxies in place that will literally take days to traverse without quantum travel. Tom Davies wrapped up development on the System Layout Tool, which our designers will be using to physically lay out our universe in-game as well as define properties and attributes of various planets and other objects within a solar system. Tony Zurovec completed the first design iteration of Subsumption, Star Citizen’s objective-oriented NPC AI system, and we’ve now moved into full production. Moon Collider – our AI partners in the UK – have started the long process of adding support for the multitude of specific features we’re going to need to their Kythera AI engine. Two of our Austin programmers – Jeff Uriarte and Tom Davies – have begun work on some of the numerous tools that will be required for the highly data-driven design, which will in turn eventually allow the constitution of the NPC population and even their daily schedules to be algorithmically determined based upon what’s occurring in the surrounding environment, and heavily contribute to providing the feeling of a living, breathing universe. Much groundwork was laid this month on laying out designs for some key elements to building our universe. We started looking into several different types of space phenomena and what types of interesting encounters they might make for our explorers out there. Each of these phenomena has different technical and artistic considerations, and we want to be sure to pick the most interesting and exciting to use as space exploration points of interest (POI). Some sensational examples we looked into this month include the Dark Nebula, Pulsar, and Ice Giant. Other things the design team have been doing are standardizing our props for environments, investigating how we might incorporate FPS into our planetside locations, and developing reputations for the various corporations within our universe. We’ve been working on other things we can’t reveal at the moment, but you will get to see a taste of it fairly soon. Persistent Universe art tasks have all been geared towards getting the first planetside location, ArcCorp, up and running. Our Art Director, Mark Skelton, has been constantly interfacing with the team at Behaviour to really push the visual envelope. Cort Soest further fleshed out the Tier Toolset which our designers and artists will use to quickly and efficiently build out planetside environments, space stations, and potentially even huge capital ships. Work on visual effects and props for ArcCorp as well as other planetside environments are being worked on here as well. Concept work for our next planetside environment – Terra Prime – is nearing completion, and full production will soon commence. Bryan Brewer and the animation team has been hard at work supporting [REDACTED] in getting the FPS characters in ship shape. We have been improving our character locomotion to look more realistic, making sure our characters have an awesome ragdoll effect for when they get blown off their feet, and moving over our existing animations to a brand new rig that will help raise our characters to next-gen quality. We have also been working on several NPC animations so that when peaceful NPC AI system comes online, our NPC’s will have something to do. Chris Smith and the ship team worked very hard to spruce up the new racing ships that were released this past month. They’ve been horsin’ around on other things we can’t tell you about just yet, but stay tuned and you’ll find out soon enough! Star Citizen QA hit the ground running for the month of September rigorously testing the long awaited v0.9. After a lot of hard work we were happy to finally share all the new features with everyone after a successful release. Then we did it all again with a total of four releases! We also continually tested our internal tools to ensure that our developers have the most up to date and stable dev environment. Thanks to our resident QA engineer Keegan Standifer, significant progress was made with our development of automated testing. This will be important to leverage as the Persistent Universe expands. This month we added two new members to the QA team. Please welcome Melissa Estrada and Jeffrey Pease! Jeffrey joins us from Blizzard Entertainment where he specialized in growing an epic beard! Melissa joins us from NCSoft where she gained valuable MMO QA experience. As a solid team, we look forward to continuing our bug squashing efforts in order to provide the most enjoyable experience possible with each future release. Work on the Publishing and Live Ops side continues at a frenetic pace. The QA Team led by Justin Binford has been burning the midnight oil on a regular basis to test latest build versions for our various development teams and for upcoming publishes to the public. Our Austin QA team works very closely with the QA team in the UK office so that we can provide testing on a virtually 24/7 basis. We’re looking forward to seeing this work on a live server in the very near future. We’ve been working on a ton of behind the scenes upgrades to our build and deploy systems so that we can decrease turnaround time on new builds and then test and deploy updates more quickly around the world. Every bit we save in this area helps us be more productive throughout our operations. Another really busy month here at Foundry 42. We’ve been heavily involved in pushing out new content for Arena Commander, working on the Character pipeline for S42 and the Persistent Universe, working through concept, design and full production on the huge amount of ships we need for Squadron 42, and of course moving forward on the design and implementation of the first missions. Lots of areas to update you guys below, and as always thanks for your support, it really makes a difference to the team, we are REALLY enjoying making this game with you guys. September was a good “Housekeeping” month for us, having been full speed ahead for the last few months, we needed some time to catch up with ourselves and some of the fixes that have gone in. Arena Commander: We have increased the size of the maps now that the Z-Buffer issue has been fixed by the engineers, (which you guys will see soon) so now sorting issues will diminish. It’s quite an achievement actually, considering that some of our asteroids are bigger than most of the levels in Crysis. Again thanks to numerous code fixes, we also got to some of the polish tasks, such as getting the asteroids rotating and placing some more accurate physics objects. A lot more design time went into the first implementation of our missiles vs emissions gameplay, and that work is now underway, as well as breaking down the planned features for the 13 stream which will include HUD mode updates, and Leader-boards and of course continued improvements to the key bindings. At the same time we are progressing on branch 14 where we plan to introduce proper lobbies, a huge amount of polish to space flight mechanics and effects, ship / helmet HUD displays, and new ships systems. Matchmaking is now becoming a big consideration, to give the community a choice on what and who they play with. Ship Design: The StarFarer got a much needed design white-box pass, and came off slightly more heavily armed, with two extra rear belly turrets on either side. Stay tuned for updates on its progress as it gets built out. All the other ships including our huge capital ships are moving along nicely. Squadron 42: We are working through a bunch of new mechanics for Squadron 42, to give the community a really immersive experience. Our verticle slice is in good shape, and so the art department is really motoring through the grey boxing of our levels and we have also started white boxing a number of new levels so we are ready for the big motion capture shoot we will be performing after Christmas. Progress is continuing well on the script, with multiple updates as we refine the gameplay within levels and we have started white boxing the gameplay (sandbox) for the interstitials (Your base or home ship), so the player will feel like they are in a living HUB which they can interact in and explore. All in all, a good month of cleaning up, and progressing Star Citizen on all fronts. One of the big pushes we’ve been making this month in getting the new controller customisation UI into Arena Commander. We know it’s something a lot of people have been clamouring for a long time (ever since the first Dogfighting module release!) and this will be the start of allowing you to set up your controller(s) just the way you like. We intend to keep developing it over future releases to give you full control of your setup. Our networking engineers have just come back from a very productive mini networking summit held over in Santa Monica, where all the networking engineers from all the studios spent a week going over the features required for Star Citizen. It’s been a really interesting week for all involved, discussing everything from player prediction on the client level, to the server architecture, databases, chat, security etc… It’s really good having these meetings for internal visibility, and make sure everything is moving forwards in the right direction. Other than that, we’ve been concentrating in the usual areas to keep Arena Commander, Squadron 42, and the PU moving forwards. Bug of the month: The Flashlight of Thor! So we were having this problem where if you flew your ship around for a period of time it would suddenly explode for no particular reason. To begin with we thought it was just the usual excuses for people’s bad flying, but when it was still happening in an empty level we did have to conclude there might be something else afoot. After much scratching of heads, and drinking of tea, we finally discovered that after an update a flashlight, which should have been attached to the player, had suddenly gone rogue. It was colliding with the interior of your ship and doing a tiny piece of damage every single frame, eventually culminating in calamity. Yes, one flashlight could take down the mighty Hornet! The graphics team have been working on some of the core tech to benefit each of the art pipelines (ships, characters, environments & vfx). For the ships we’ve been continuing work on the new damage shader that will give us fine grain location specific damage. This will be crucial for capital ships where the traditional method of cutting a ship into numerous meshes won’t be practical due to their immense scale, but this will also benefit smaller ships. We’ve also started work on the shader that will enable us to create custom paint jobs. This isn’t as simple as just swapping some textures because our paint jobs need to be sharper than is possible with traditional textures to maintain our high quality bar, but the paint also needs to degrade over time and respond correctly to the damage system (e.g. bending & burning). For the vfx team we’ve created a volumetric lighting shader for particles to approximate complex effects such as multiple-scattering of light and volumetric shadowing. 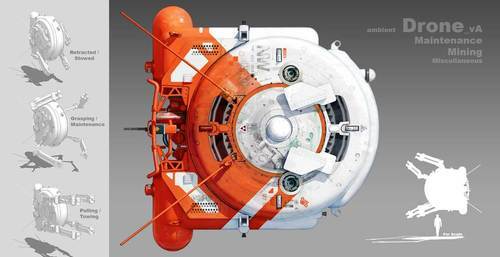 To achieve this the vfx artists bake out 6 separate passes of an explosion or smoke from an offline fluid simulation, and the shader uses these to calculate how the in-game lights would bounce around inside the gas. The end result is smoke and explosion particles that are lit correctly with the in-game lights but approach the quality of an offline render. We’ve also been working on two general pieces of tech that should benefit the whole game, the first of which is 32 bit depth rendering. We’re moving towards 64 bit physics to handle enormous maps, however rendering doesn’t require such precision because from the cameras perspective everything is actually relatively nearby. However most games actually use just 24 bit depth buffers and this isn’t enough for large space scenes and so we’ve just completed the transition to 32 bit rendering. This has allowed us to enlarge the small dog-fighting maps which we desperately needed since the recent speed increase of the ships! The other general tech we’ve been developing is the ability to combine multiple textures at run-time to allow us to dynamically combine multiple objects into fewer large objects. This will significantly improve rendering performance while maintaining the flexibility and modularity of building the characters, ships and environments out of many smaller textures, which is crucial for the persistent universe (customisable ships, clothing & hangars etc). You want Ships? – you got it! The Gladius is now in the tech setup stage, making it suitable for the Hangar stage of release. The Retaliator is now 50% more awesome since you saw the video released recently (it was about a month old) along with the Gladiator which has most of its exterior given the PBS treatment with the complex dual cockpit/gunner interior next. The Idris and Javelin are still coming along and we are taking into account the Sq42 storyline, adding a few tweaks here and there to shapes and structure to create a more cohesive environment. The wait will be worth it, I promise. 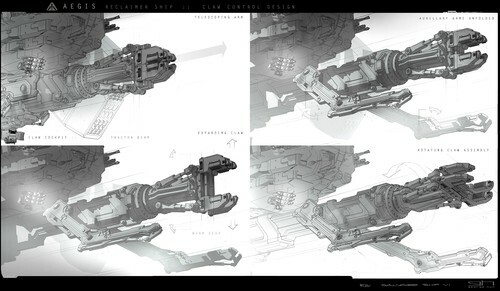 New and noteworthy, some of the Vanduul fleet is going into production which we need for the storyline too – tune in next month for more info – we are really excited about this as we can now really start dialing into who/what the Vanduul are and what their construction methods are. You want Environments? – you got it! Shubin mining facility – ‘Archon’ has reached the stage of Greybox complete, it’s a huge challenge but the visuals are matching its physical size, no shaders yet, just lots of geo, I mean lots! To give you an idea there are at least 26 landing pads located around the facility, each of them the player can land on, get out of their ship and walk around. All of these details will help make the Shubin Archon Facility feel like a living and breathing environment. You want concepts? – you got it! Concepts department has slowed a little this month (instead of 100mph its more like 90mph :P). Shubin interior wrapping up, Starfarer has been given the ‘Parry’ treatment and a full interior has been worked out along with some meddlesome functionality issues, this has now gone out to be fully visualised, it’s a pretty big ship so it won’t be done in a week if that’s what you think! Xi’an transport ship interior is also taking good shape, we’ve now dialled into a visual language that we are happy with, it makes developing the rest of the rooms a ton easier once you have a few key factors to launch from. Focus is also shifting to answering the niggling parts of the UEE crew costumes, we are taking a systemic approach of really defining how these designs will work, how they fit with the customization system and do they have the level of detail we need to keep Chris and you the fans happy. You want animations? – you got it! Animation department (who we are looking to grow) has started looking at Previz and prep work for some of the in game action sequences – I can’t give much away at this stage without giving out spoilers. We’ve also been supporting the design department working on specific game mechanic animations, it’s an important part of the process, early Previz for design often saves on wasted work further down the line. You want spice with your VFX? – you got it! Self shadowing lit particles, mmm, tasty – that’s what the VFX department has been developing with the tech department, we’re still trying to think of a name for this technique/texture format by the way, we’d love for it to be something snappy/media-friendly, but the current name is SSL (Self-shadowing lighting). Aside from that, we’re also starting to improve the vehicle damage effects starting with smoke and fire, trying to make a cleaner more efficient system that has greater long term effects for the project. That’s it – a full on man vs polygon serving of heart stopping griddle cooked CGI goodness. This month the audio team have split between Citizencon related tasks and the upcoming demo of the FPS module. The environment sounds for the demo level are starting to shape up. A lot of attention is being paid to the details in this area. All of the whirring, hums, and general ambiance comes from specific points in 3d space. We we’re never going to be satisfied with a faked 2d ambient soundscape! Computers will idly tick away, screens and lights will hum and buzz, air conditioners and fans will whoosh and whirr! This will all move around you as you move your player. We’ve also been working on R&D and generally testing the water with the FPS weapon firing. There’s a lot to consider with something like a gun sound! First person gun firing, iron sights gun firing, 3rd person gun firing, gun sounds over distance, environmental effects on gun sounds and this is just firing the guns!! Getting this right is a long process and will be ongoing long into the future. Even so, we are hoping that with the work we’ve done so far, it’ll be a great start to the FPS sound when it is demo’d for PAX. Other than that we’ve been working on a selection of the fps gadgets and trying to keep up with the unending (but awesome) onslaught of ship related sound tasks! September was a month of great accomplishments for the Montreal team. We can’t wait to have you try out all of the new features we have been working on, and we are looking forward to hearing your feedback. As always, it is a great pleasure to be a part of creating this game for you guys. Meanwhile, here is the latest update from the team. 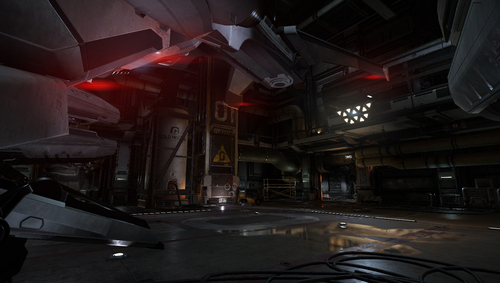 On the level design side the guys have been hard at work debugging and working on the new hangars. We have also (re)started work on blocking out Planetside locations which we’ve been designing on paper quite a while now. Seeing them finally taking shape in-engine is “SC grade” fantasticness! More flair objects have been designed (we probably have enough flairs lined up for the next 18 months 😉 Our goal is to incorporate as much lore as we can into the flair objects we design, which keeps them interesting and unique, so they don’t end up getting fed to the monster living in your hangar’s garbage compactor. On a related note, some special add-on rooms for the hangars are in the brainstorming phase. If all goes well, you’ll be able to add them to your hangar in the future. With Gamescom and the bulk of the work for the new hangar public releases now behind us, we’ve (re)kicked off mobiGlas development. Hand in hand with the fabulous UI team, we’ve refined our designs for various mG apps to get them ready for production: mG HOME, easyShop, Wear, skyLine and Scheduler, to name a few, are in the pipeline. mG Scheduler already has a version running in the engine and is coming along nicely. On a more technical note, we’ve been working closely with engineers to develop the TAG system tool which allows us to tag practically every object in the game world. It’s a bit like hashtags on Twitter or the use of keywords in search engines. With this powerful tool we will be able to add and query items dynamically in-engine for faster, more efficient development, and the real bonus for the design team: the ability to track and update the game seamlessly. One of the main focuses for programming during the month of September has been to complete and deliver a first version of control customization to the public. There are still loads of features that we want to add to it and we’ll definitely be working on it for a few more months. We’ve also spent quite a bit of time polishing and debugging the new version of the pause menu that was released earlier this month. After a couple months of working on a few higher priority tasks, we’re finally getting back to mobiGlas development. Our new Tag Editor Tool has been receiving a lot of focus and attention internally and we’re eager to connect it with the next systems we are planning to implement. As usual, the hangars weren’t left behind as we reworked the ship spawning algorithm to support the feature where players will be able to customize their hangar ship layout through the RSI website. Finally, we’ve also added a few nifty flair items for our subscribers to enjoy. This month a lot of work has been going into developing control customization, which we will be rolling out in several phases. Engineers and UI artists alike have been working hard to make sure that the user experience feels just right. As mentioned, we have also moved into asset development for various mobiGlas apps, specifically HOME and easyShop (for starters), as well as some of the core components that will be used across all mobiGlas apps. We have also been having a lot of fun creating decals, in-fiction billboards, and fake ui screens for the ArcCorp Citizencon environment. Another month flies right on by faster than the Murray Cup leaders and PAX Australia is approaching quicker than a fully equipped M50! September has been a crazy month for the FPS team. We have been pushing hard to make sure everything is ready for the big event and we really, really want to knock all of your socks off. This past month we were focused on getting all the last pieces of the game we plan to show at PAX implemented and the month of October will be spent polishing and tweaking all those pieces leading up to the event. Our Creative Director, Lead Designer and Level Designers have been putting the final touches on the level we plan to show at PAX Australia. In addition to that work, they have also been creating paper designs and grey room levels for the FPS Module. Work continues on destructible objects as well and there is now a really good amount of things that shatter, fall to pieces and explode populating the FPS environments. All of this detail gives a real sense of power to the weapons. The design team has also been finalizing weapons balance, at least for the PAX event. As we’ve mentioned before, weapon balance is an ongoing task that will continue to be worked on up to the FPS Module release and beyond, especially once you Citizens have had a chance to dig your teeth into FPS and give us that invaluable feedback. Throughout last month, the programming team has been focused on getting everything implemented and functional. There has also been lots of collaboration with the animation team to get everything looking and feeling right. This isn’t your standard FPS… and the approach we are taking relies very heavily on animation and code being perfectly in sync. I don’t want to say any more than that at this point, but feel free to speculate as much as you want! Other programming tasks over the last month have included some pretty major fixes in physics and networking. All of the weapons and gadgets are now working over the network properly so we can really start play-testing them and iterating as fast as possible on the mechanics. Lastly, there was a very productive Networking Summit that took place at CiG Santa Monica where all of the brightest coder brains from each studio gathered to discuss things that I won’t even pretend to understand. Wow, the animation team here has been crazy busy… probably more so than anybody else at [REDACTED] (and that’s really saying something considering how busy everybody else has been!). They have been working on re-targeting animations to a new rig that fixes a whole slew of issues. In addition, they have been working with design and programming on a daily basis to make sure that Star Citizen FPS is something truly unique. We can’t wait for you Citizens to see what they have been putting together for PAX and we sincerely hope that you will notice the differences in what we are creating. I also want to mention that the team in Austin has been giving us a huge helping hand with animation in general. We couldn’t have done it without you guys, and we really appreciate the help. Speaking of big helping hands, Foundry 42 has taken on the task of finishing out all of the sound effects for PAX and some big thanks are in order there as well. It really is amazing to be involved with such an ambitious game where everybody at all the studios involved are so willing to pitch in and help each other out where it’s needed. The guys over in the UK are putting together some amazing sound effects for the remaining weapons, gadgets and grenades as well as doing a huge amount of environmental sound effects that should make the FPS Module sound as good as it looks (and believe me… it looks amazing!). The art team here has really done a spectacular job over the last month. While finishing up modeling and textures for the last few gadgets that are needed for PAX, they have been adding an insane amount of detail to the environments. I have been in the industry for over 10 years, and I can honestly say that I have never seen this level of polish in visuals before (except the work coming from the rest of the Star Citizen team!). It is something truly amazing and my hat goes off to them. The visual FX team has been iterating and polishing the weapon and environmental FX, and that work will continue over the next few weeks. Impact decals and particles have also been going in, which looks amazing when combined with the destructible environments. That should about wrap it up for the [REDACTED] report this month (yes, I know I killed that joke for most of you last month and I apologize). Before I sign off here, I want to throw out a big thanks to High Admiral Tristram who sent us a care package with some Nerf guns in it. Thanks from all of us Tristram! Now back to work… see you in a month! Pushing hard into September, the team has been putting most of it’s effort in supporting the deployment of R13 and the leaderboards system that is used to rank players in the different game modes on the web platform. We’re really excited about this subsystem because not only is it a very awesome feature it’s also the first time the game servers are sending data back to your account. We plan on using that to give you more ways to access the different data points that you generate as you pilot your ship in Arena Commander. As always, seeing the reaction of the community to a launch is always the best part of working in the Star Citizen universe. Most engineering time was spent supervising the deployment of the leaderboards system. As you play Spectrum Matches, definite statistics from the match are sent back to the platform for ranking and processing. The data pipeline created at this stage makes use of a durable and persistent messaging queue system that allows us to never lose a game and always compute the rankings and stats, very useful for the cloud environment we are in which can be unpredictable at times. Some interesting challenges were also tackled as to how we would persist actual player rankings in a way that would allow us to display a custom board for player who do not share a sequential rank. A good example of this would be a “per Organization” leaderboard. A very cool new feature that you technically should have in hands now is the hangar configuration utility. This new tool, accessible in your “My Hangar” allows you to pick which of your ship shows up in which bay of your chosen hangar. This new subsystem exposes the different hangar bays to the platform so that you can hand pick which of your ships you want to see, giving the players control over this process that used to be powered by an algorithm. The team finally had time to look at some of the chat system issues web users have been experiencing! With the deployment of a new set of connection managers(a process that handles HTTP to XMPP socket connections) it seems the disconnect issues that players were experiencing have been resolved. Coupled with a few web client bug fixes the chat experience should be greatly improved. Chat away! Onwards to the lobby system! The UX and Art teams have been doing some headway on a new home page for Star Citizen as well as revamping the experience for new players. This includes new video content ; new website UX, new player guide, etc… This is the beginning of a long process to try to distill the Star Citizen universe for new players but we hope to bring this plan to fruition in bite size pieces as they get ready. We’ve been able to have a design review on the Organization Forums functionality that was designed earlier this month, a first step in validating our hypothesis before continuing the design process. UX also compiled a list of add-on features we want to develop for the Holo-Viewer on the site. 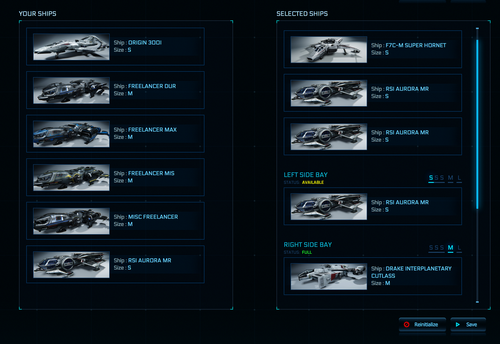 Some examples are the addition of a “Scale HUD” (to show relative ship sizes with units), a global “Ship Explorer” not tied to the different store pages where you could swap between manufacturers and ship without leaving the viewer giving a more prominent place for the viewer in the site. Last but not least, the content and design effort for the Starmap are under way! Sorry, no more details yet! This has been a really solid month of developing infrastructure and core features for our AI systems, with a particular focus on FPS combat and persistent universe AI. A lot of design and implementation work took place this month to get these systems feature-rich enough that the designers at the other studios can really start going to town and doing cool stuff with the AI. There’s still plenty more to do, but we’re really happy with the progress we’ve made so far. A large part of our recent work has been on a deep and significant refactoring of how designers give AI tasks to perform, trying to find a good balance between flexibility and robustness. We think the AI in Star Citizen will be much more interesting if designers can be specific with what they want the AI to do at certain times, but the rest of the time can rely on the AI to be smart and sensible. We’ve all played games where AI do crazy things, and designers work hard to stop this from happening, so we’ve been designing a system to streamline this as much as we can. Squadron 42, in particular, should see a real benefit from this. We’ve been working on this for a while, but this month we made some serious progress implementing it, and as part of this we spent a lot of time figuring out the details, from the high level tasks that the AI are assigned, through the mid-level behaviors that they run, right down to the low level actions. And a key part of this design is iterating over ideas with the designers to make sure what we’re coming up with is easy and intuitive for them to use. There was also a lot of design work this month fleshing out details of the persistent universe, with a particular focus on making sure our design is in step with the other teams doing persistent universe work. There are lots of little details to figure out, from the way AI do interesting and lifelike things in the world, through to what the tools should look like that designers will use to create this world. As mentioned above, we did a lot of work this month implementing core architecture for the way AI are controlled. This work affects all of the AI in Star Citizen, including the dogfighting AI you’re already using. We’ve been converting everything to a new behavior system that will allow us to create complex and interesting behaviors much more easily. There was a lot of work to be done here, but we were successful and as a result we look forward to doing some interesting things with AI next month, which will be revealed in due course, so keep an eye out for that! On the FPS AI front, we’ve had for a while now characters that can see, but it was finally time to give them the ability to hear as well. Gunfire, bullets whizzing past their heads, footsteps of a player trying unsuccessfully to be sneaky; these are all things that a good AI should be aware of, and now they are. And now that the AI know more about the world, we can give them more interesting behaviors, which we’ve started doing using our new behavior systems. Finally, for the persistent universe, we’ve been doing some work on allowing AI to use items in the world. We implemented a system that allows designers to start setting up objects in the world and make the AI use them. There are more complex interactions to come, but already we can make the world feel more alive, and it will be exciting to see this develop further over the coming months.